The decision by the Malaysian government to appoint women judges to its Islamic courts has been welcomed by Muslim feminist groups. 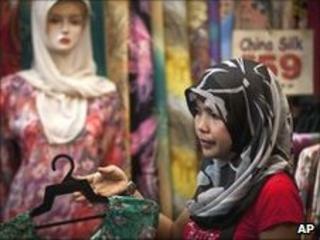 The Sisters in Islam (SIS) group based in the Malaysian capital, Kuala Lumpur, told the BBC it had been pressing for this for many years. The government said the new judges were part of its sharia reform efforts. Malaysia runs two parallel legal systems - the civil courts for its non-Muslim citizens and the Islamic system. "We've been calling for the appointment of women to the sharia courts since the late 1990s," said Ratna Osman, head of the legal unit of SIS, an influential Muslim women's group. "When you have all male judges, there is some insensitivity - the more so when they are listenining to women's grievances," she said. The group has long campaigned for reform of the Islamic legal system. It argues that Islam does provide legal protection for women, but that it is not always administered and implemented properly and fairly. Ms Osman cited the case of one woman who had to wait seven years before her plea for a divorce was heard in a sharia court. In the meantime, her husband had started a new family while refusing to give her a divorce. "This is just one of many cases," Ms Osman said. The government announced the two new judges as Suraya Ramli, 31, in the Federal Territory of Putrajaya court and Rafidah Abdul Razak, 39, in Kuala Lumpur. "The appointments were made to enhance justice in cases involving families and women's rights and to meet current needs," said Prime Minister Najib Razak. The government has also allocated RM15m ($4.7m, £3m) to the Family Support Division to help women in need of financial support. The civil judiciary has long had female judges, covering a range of major cases. The Islamic legal system focuses on family law, frequently tackling issues such as divorce, polygamy and custody battles. "The requirement is always for the woman to prove the abuse, it is a very heavy burden," Ms Osman said. She said the new judges were a positive step, even though "two women can't address all the problems we have with the sharia system". The Women, Family and Community Development Ministry as well as Wanita Umno, from the women's wing of the ruling party, also praised the appointment of the two women judges.